Stage 3 otherwise known as getting messy with colour! 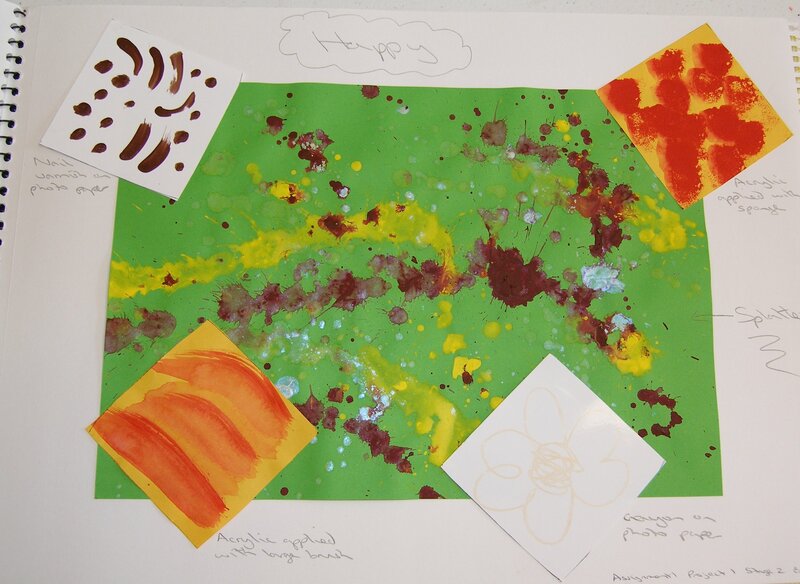 This was an opportunity to try to make marks representing some of the same words from the earlier exercise but this time using colour and a variety of mediums. Here is my sheet for the word “sad”. It includes kitchen paper very sparsely pressed into acrylic paint, acrylic paint applied using cling wrap, brown acrylic paint applied in downward strokes with a finger and then blotted, wet paper on which green acrylic paint was smudged onto and wet photo paper with faint watercolour pencil squiggles. 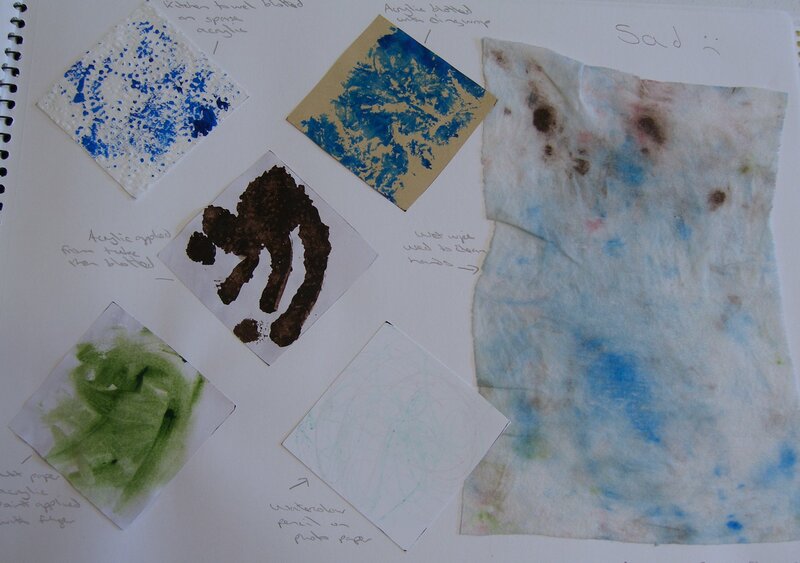 The larger sheet to the right is the wet wipe I used to clean my hands with between these experiments as I thought the smudgy, dull colour palette represented the word sad very well. As a distinct contrast to “sad” I splashed out with bright colours for “happy”. The marks are happy as well, with splatters of paint across a sheet of paper and wild smudges and squiggles. Top left I used some bronze nail varnish wish is really shiny but doesn’t show well in the photo. 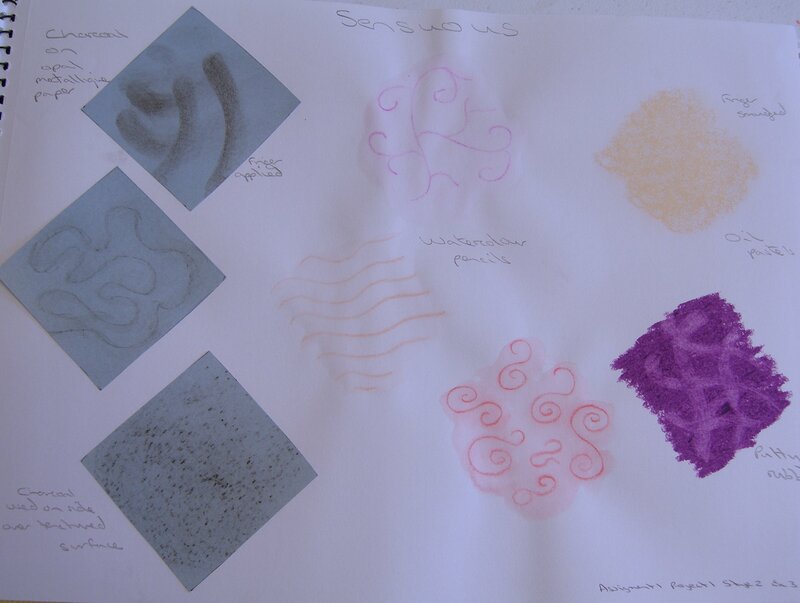 Here are my marks for “sensuous”. As with the pencil marks in exercise 1 I used curvy, flowing lines and soft smudges. Charcoal smudged onto a metallic blue pencil produces a soft, velvety result. I like the result of the watercolour pencils as the marks made are still visible but they are surrounded by a gentle wash of colour. Then I used some oil pastels which I first smudged with a finger and then used a putty rubber to remove some of the colour to leave a softer underneath layer showing. The choice of colours in these exercises helps to represent the words as much as the marks themselves do. For sad I chose muddy brown, blue and a dirty green. Happy contrasts with bright, cheerful yellow and red to give an uplifting effect. Sensuous works with gentle, languid washes of pastel colours or grey velvety smudges.